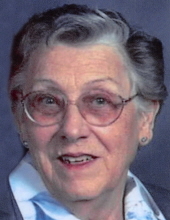 Ethel Norma Harris, 92, of Nevada, passed away Wednesday, April 10, 2019, at Windsor Manor in Nevada. A memorial service will be 11 a.m. Saturday, April 13 at Memorial Lutheran Church (701 11th Street) in Nevada with Pastor Myron Herzberg officiating. Visitation will be one hour prior to the services. Inurnment will follow at Nevada Municipal Cemetery in Nevada. Ethel was born November 21, 1926, in Mills County, Iowa the daughter of Jerry and Ada (Hartley) Lemons. She attended school in Lineville, Iowa and graduated from Nevada High School in 1944. On February 24, 1945, Ethel was united in marriage to Arthur Benjamin Hill at the Little Brown Church in Nashua, Iowa. Arthur passed away in 1960 and on March 3, 1967, Ethel was united in marriage to Lynn Duane Harris in Nevada. Ethel worked 28 years for Donnelly’s Marketing in Nevada, retiring in 1986 and was a devoted member of Memorial Lutheran Church in Nevada. Ethel enjoyed sewing, cross stitching, quilting and reading. She was an exceptional baker and was known for her apple pies, kringla and cinnamon rolls. Ethel and Lynn had a cabin on the Mississippi River for 25 years, where each grandchild got to spend a week with them fishing. They also would spend two weeks a year in Canada fishing. Ethel is survived by her husband, Lynn of Nevada; her children: Pat (Dave) Fischer of Des Moines, Gary (Phyllis) Hill of The Villages, FL and Janice (Ray) Bothun-Hill of Des Moines; her seven grandchildren: Tim (Donna) Kinnan, Brian (Joni) Kinnan, Deb Paulin, Becky (John) Thomton, Alana Bothun (Brian Kraft), Erik (Chelsea) Bothun and Adam (Jenn) Hill; her seven great-grandchildren: Bryson, Paige, Summer, Zachary, Alyssa, Mia and Dane. She was preceded in death by her parents; her first husband; and her siblings: Harold Lemons, Maxine Eggland, Elaine Vinzant, Gwendolyn Moss, Wayne Lemons, William Lemons, Ray Lemons, Duane Lemons and three in infancy. Memorial contributions may be made to Memorial Lutheran Church in Nevada. To send flowers or a remembrance gift to the family of Ethel Norma Harris, please visit our Tribute Store. "Email Address" would like to share the life celebration of Ethel Norma Harris. Click on the "link" to go to share a favorite memory or leave a condolence message for the family.